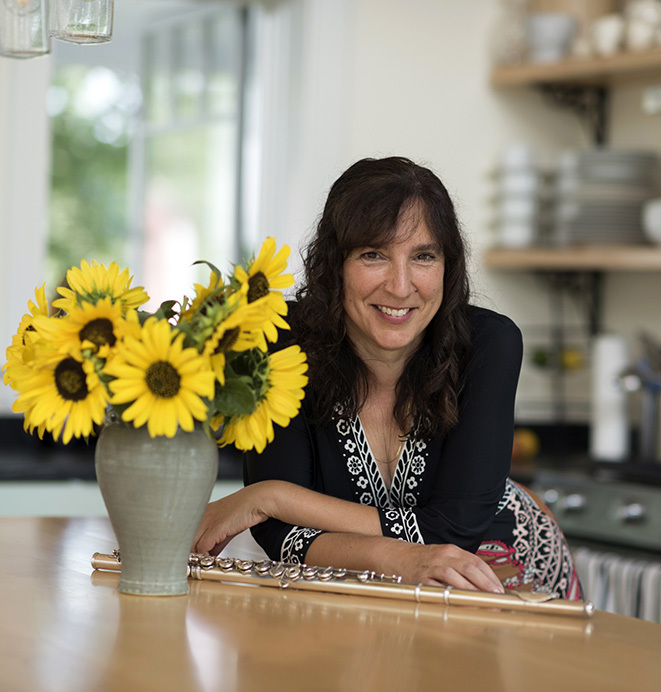 Known for her warm and engaging teaching style, Karen Kevra has trained many of the finest young flutists in New England. Students are accepted into her private studio on an informal audition basis. In addition to private study, Karen teaches workshops and master classes for flutists of all ages. How would you describe your teaching approach? Making music is one of the great privileges we have as humans. From my experience both as a parent and the teacher of young musicians I can tell you that it is a joy to watch a child make their way through the world in the company of an instrument. There is no question that it is a kind of relationship, and like personal relationships it has similar rewards, fun, challenges, and ups and downs. Playing an instrument is wonderfully complicated. We are required to synchronize all of the aspects of our playing including breathing, blowing and manipulating the embouchure, moving our fingers, articulating, adjusting our intonation, phrasing, and listening to others, while trying to convey a musical emotion. Talk about multitasking! My approach is to break down the playing into these various categories and isolate each aspect into its purest form. I provide every student with a personal practice journal with separate categories including tone, finger technique, articulation, control and flexibility, etudes, repertoire. It becomes an effective "to do" list for practice. We start simply and over time the demands become more complex. For example, we begin articulation with simple legato and staccato tonguing, then gradually add varied articulations, and finally more advanced techniques including double, triple and flutter tonguing. But we also return and review the basics. I believe that review is what builds technique and confidence. What is most important about the student/teacher relationship? Trust. As a teacher, I frequently ask the student to take a risk in a particular aspect of his or her playing--from how they breathe, to the shaping of a phrase, to expansion of their dynamic range. I can still remember my early lessons -- the anticipation, the excitement, the nerves. While for some students it may not seem like a big deal to play an arched phrase with a focused, controlled sound, to others it may feel like baring the soul. It can take time, but I believe it's the job of the teacher to earn the trust of the student. Once that is accomplished, a committed and hardworking student will rise to the challenge of playing the instrument at increasingly higher levels. I think it's important to find common ground with a student beyond the flute. Frequently a student has a passion in other areas, say poetry, or drawing, or dance, even culinary arts. I do all that I can to make connections between those interests and flute playing. I began playing the flute at the age on nine in my elementary school band in suburban New Jersey. My high school studies were with Judith Peckmore of Lincroft, New Jersey, who was clear and direct and grounded me in strong fundamentals. Later I studied with the late New York City flutist Eleanor Lawrence, and Philip Dunigan, who was my flute teacher at the North Carolina School of the Arts. The teacher with whom I had the longest and closet connection was Marlboro Music Festival co-founder Louis Moyse with whom I studied for over a decade. Louis died in 2007 but there is not a day that goes by without thinking of him. I hear his voice, remember his gestures vividly, and still feel his presence whenever I play. My musings on my studies with Louis Moyse are available here. In recent years I have studied with John Heiss at the New England Conservatory, who is terrifically smart, and brings the composer’s perspective first and foremost to the music. I have learned a great deal about orchestral repertoire, and preparation of orchestral excerpts from Jeanne Baxtresser, former principal flute of the New York Philharmonic. Jeannie has a sound that stops you in your tracks and is a window into her soul: pure, luminous, and astoundingly beautiful. I am deeply grateful to all of my teachers for the unique relationship they have had with the flute and their willingness to share it with me. Your students typically occupy the tops seats in All-State, All New England and area youth orchestras. Many have gone on to study at the county's top conservatories and universities. Do you accept only advanced students? Not at all. I teach students of all ages, levels, and abilities. What matters most to me is that the student is invested and is willing to roll up their sleeves when they walk through the door for a lesson and make a real effort. I often start students as beginners. In fact, many of my most successful students began with me at an early age, between 8 and 11 years, and continued through high school and beyond. There is a special bond that forms between a student and teacher in the study of a musical instrument. We come together once a week to explore the thing we most love in the world. I count it one of my great blessings to be involved in the life of a student/to have this regular contact, and to watch them grow up from a child into a young adult. What you say is the most important aspect of flute playing? That's a big question! If I had to choose one technical thing, it would be the ability to produce a beautiful sound ALL OF THE TIME. You really won't impress anyone, even with the fastest, best controlled fingers, and impressive articulation, if you can't produce a beautiful sound. My students and I work at great length on tone development, in ways that are challenging, inspiring, and fun. In terms of the bigger picture, I’d say that mindfulness in the study of the flute matters most. All of the aspects of our playing including tone, breathing, finger work, articulation, vibrato, and phrasing, must be developed in an organized, disciplined, yet fresh creative and fun way. The constant advice that I got from my own teacher, Louis Moyse was, "Be alert. Be aware." My students are very familiar with these simple phrases. Not only good advice for flute study, but for life.